Lawrence County Museum of History 15th Street entrance. 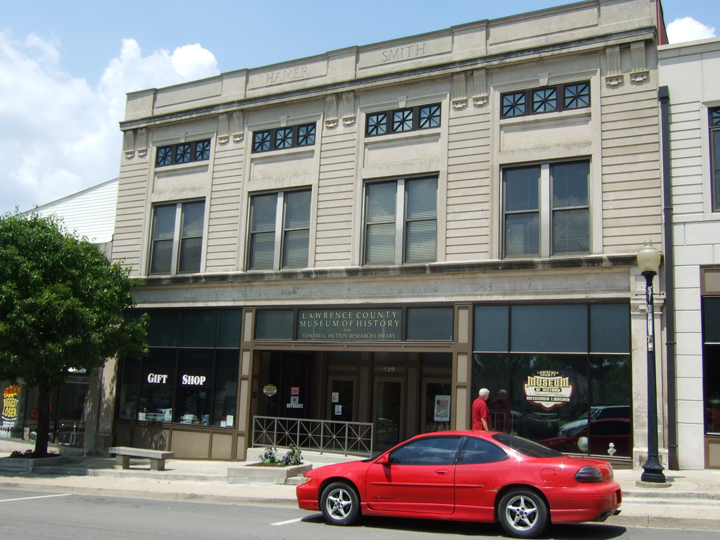 The museum is housed in the 100 year old Hamer-Smith building at 929 15th Street in Bedford, Indiana. The Lawrence County Museum of History is home to many interesting artifacts that showcase the history and heritage of Lawrence County. Most of these are housed in the 2400 sq. ft. gallery. You will find the gallery cases arranged thematically with collections focusing on military history, antique clothing, school history, and many other topics. To access the museum, you can park off-street in the large parking lot at the north entrance. Parking is also available on 15th street at the south entrance. The museum is handicap accessible at the north entrance and there is a spacious elevator and a staircase to reach the second floor library. Read about the history of the Hamer-Smith building. Read about the building restoration. 1924 Roots of the Lawrence County Historical Museum began with Bedford’s centennial celebration in 1924. Mrs. Zora Askew was president. 1931 Museum opened in the Courthouse basement. Mrs. Zora Askew became museum coordinator. 1940 Lawrence County started paying for a full-time curator. 1982 Lawrence County Historical Society and the Lawrence County Genealogical Society merged. 1989 Incorporated as a 501-c3. 2000 Purchased current building and 14th St. parking lot. 2001 Renovations began on the Hamer-Smith Building. 2002 Museum moved temporarily into the J.C. Penney building on NE corner of 15th and J Streets. 2005 Opening date for the 12,000 sq. ft. Museum and Library. 2008 100th anniversary of the Hamer-Smith Building. The north entrance is located near the large off-street parking lot.